Just outside the village of Hornby on the A683 to Lancaster, lies a medieval moated site. The remains lay in the field between the road and the river Lune. Above. View into the ditch, looking West. 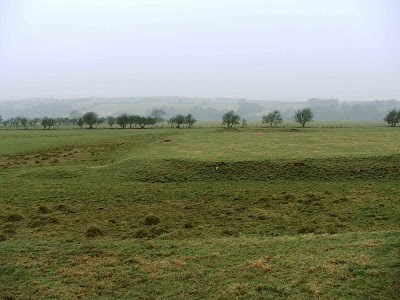 The site consists of a complex of a moated outworks, with interconnecting channels surviving as well defined earthworks. Some of these channels appear to link the moat with the River Lune to the West. The whole site looks great from Google Earth's aerial photos. Above. View of the raised earthwork platform, looking North East. The only documentation that I can find relating to the possible history of this site, is that it could be the remains of the fortified manor house and park built in 1479 by Sir James Harrington. Above. 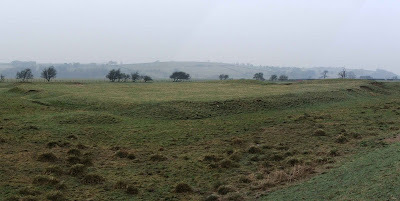 View of the earthworks looking West. Licence to crenellate the buildings was granted and the site was strengthened and a park created. Both the fortified site and the park had reputedly fallen into disrepair by the 16th century. Above. Full view of the earthwork platform looking North. There are the remains of some masonry on the highest end of the earthworks, possibly the remains of a wall. Other masonry was visible when the site was excavated in 1978, when a narrow hollow way was discovered, linking the site with the nearby main road. The earthworks are just and so visible from the main road, but are not accessible. The site was excavated in over 1964 and 1965, producing evidence that there was activity here during the 13th and 14th centuries. A number of finds were removed from trenches dug on the platform, including coins of Edward I, iron nails, bronze pins, an iron arrow head, a number of bronze rings, some window glass and an array of pottery sherds. A hundred years away to the North, a small, 10 meter by 10 meter platform was noticed, probably representing the remains of a dog kennel. Above. Plan of the masonry found on the main platform. The masonry on the main platform was substantial, and thought to represent the external walls of a large building. There was not enough of this building left for the excavators to even make a guess as to its use though. Above. Photo of the masonry. Above. Plan of the site made during the 1965 excavations. This additional information comes from a report by A.J.White, and offers us only what is already available on the internet now. He summarises that, in his opinion, the site was built as a hunting lodge with the smaller platform built for dog kennels. The site may therefore have been built originally as the seat of the Harrington family's local interests and fortified to reflect their local importance, abandoned, possibly unfinished, and later turned into a hunting lodge or keeper's lodge. Documentary evidence is sparse. If any further information regarding this great sites comes to light, I'll make sure this post is updated.